Disasters are typically unexpected, sudden and overwhelming and for many people they can take an emotional toll. It’s common for people to suffer from high stress, anxiety, depression and other trauma related illnesses. Many do not know that immediately after a disaster strikes a community the American Red Cross deploys highly skilled professionals to shelters and assistance centers to provide individual psychological triage, community mental health surveillance, psychological first aid, psychoeducation, community resilience training, advocacy, crisis intervention and condolence support. Georgia Tiessen, a Red Cross volunteer with a Masters in Social Work has been diligently helping victims of the Butte fire get the vital help and resources they need to cope in the days and months ahead. Delores lost her home and barely got out with her life escaping from the Butte Fire on September 9. She was waiting outside of the Red Cross Assistance Center in San Andreas visibly upset as her husband was signing up for Red Cross Services. “I have anxiety issues and I just couldn’t go in with him; I needed to separate myself”, she said. 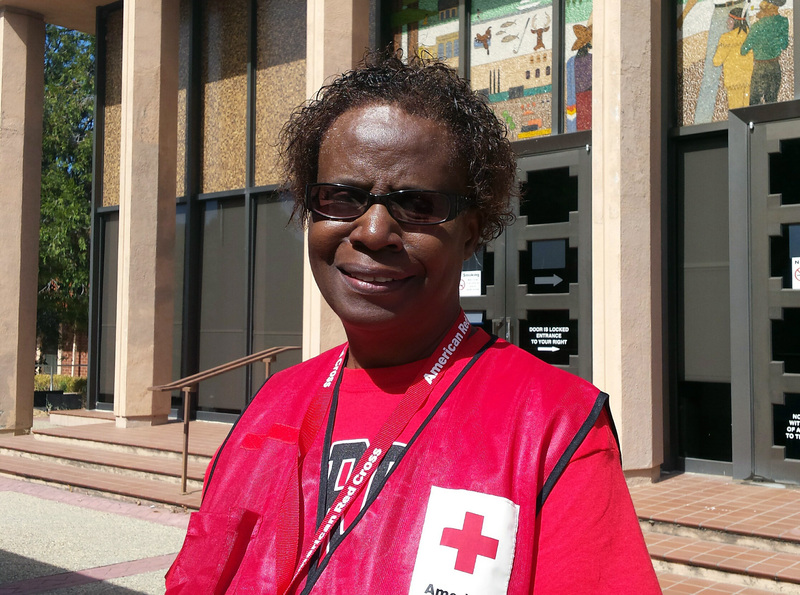 “We lost everything and have to start over.” Mental Health Volunteer Georgia Tiessen not only made sure Delores got her hot lunch as she waited, Georgia counseled her, gave big hugs and the resources Delores will need to help her overcome. Compassionate mental health care is just one face of recovery when disaster strikes and for Delores that face was Georgia. There are many ways people can volunteer with the Red Cross, including serving as a disaster mental health worker like Georgia Tiessen. Join the team today!